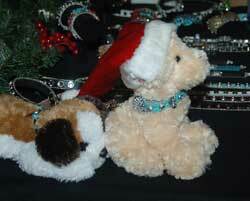 Express file photo The annual Papoose Club Holiday Bazaar has many creative gift ideas for the holidays. The 20th annual Papoose Club Holiday Bazaar is a holiday shopping experience for the whole family with kids activities and unique gift ideas. The bazaar will take place on Saturday, Dec. 4, from 9 a.m. to 5 p.m. and Sunday, Dec. 5, from 11 a.m. to 4 p.m. at the Hemingway Elementary School in Ketchum. In celebration of 20 years, raffle tickets will be $2 and 20 for $20. "It's a great community event," said Molly Page, event co-chair for the past three years. "We have over 50 vendors." Page said that this year the bazaar will have 20 new vendors, which is very exciting for shoppers. "Some vendors will have body care products including local Sun Valley Remedies products by Alison Ballentine," Page said. "We will also have great new jewelers from Boise." The bazaar will include work by Nancy Liston, Karen Johnston of KJ Jewels and Wanda Baldwin of Momie Skirts. The Papoose Club will also have its annual cookie sale with special holiday cookies, which raises money for the club and events in the valley. "The soup café will provide a place for people to have lunch," Page said. "Papoose Club members make all the soups." This year, children will enjoy entertainment with performances by valley musical groups. Page said several groups from around the valley will have activities for kids, which is great for parents while they shop. The bazaar will also have a booth for kids to write letters to Santa Claus. "The Wood River Arts Alliance will have a craft booth and the Bead Shop will have free children's crafts," Page said. "The Girl Scouts will also be doing something for kids." The Wood River High School Senior Bash organizing committee will have a "cakewalk" (a parade of cakes for sale) to raise money for Senior Bash, which will take place the night before graduation at the Community Campus in Hailey. A cakewalk will take place every 15 minutes. "It's a good day out for the family," Page said.